As Valentine’s Day approaches, couples everywhere contemplate taking their relationship to the next level. In some cases, this means moving in together, a big step worthy of celebration… and logistical concerns. 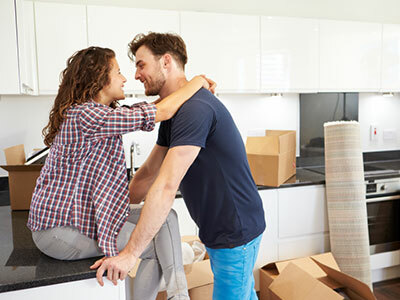 Whether you’re moving into a new place together, or, moving in with your partner, follow these guidelines, and cohabitation will be smooth as can be. 1. Adhere to the 60/40 rule. If there’s a male and female involved, the woman automatically gets at least 60 percent of the closet AND drawer space. I hate to be sexist, but if you want this move to go smoothly, do as I say. 2. Divvy up the drawers. Each adult needs at least three to four drawers in the bedroom. One for undergarments, one for socks, one for sleepwear, and possibly one for gym clothes/shorts/swimwear. Anything else can be folded on shelves. 3. Dump the duplicates. You don’t need two sets of dishes, two cheese graters, two sets of steak knives… you get the picture. Pick the best, give away the rest! 4. Expel what’s expired. Prior to the move, you both need to discard any medications, sun block, and prescriptions that have loitered past their expiration dates. This will free up space in the soon to be shared medicine cabinet. 5. Banish the books. Books are heavy to move; don’t move a book unless: it’s a favorite, it’s a good reference book, or it will look nice on a shelf or coffee table. 6. Limit the linens. You only need two sets of sheets per bed, and 4-5 towels per person. Discard any extra sheets that don’t fit a bed you’ll currently be using. This may be a good time to give away the sheets you used on your dorm bed in college. 7. Set the table for two, and enjoy a romantic dinner!